China has unveiled a series of moves aimed at boosting growth, indicating that policymakers are concerned about the slowdown in its economy. The steps include tax breaks for small businesses, reduced fees for exporters and opening up of railway construction. 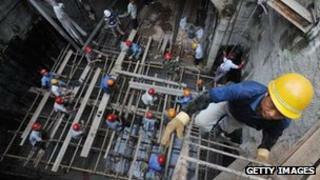 China's economic growth rate has slowed for two quarters in a row and there are concerns that it may slow further. But the cabinet said the economy was in a reasonable shape and it was pushing for reforms to stabilise growth. "The economy is still running in a reasonable range," the cabinet said. "We must look at now and beyond to let restructuring and reform play an active role in stabilising growth." Data released earlier this month showed that China's economic growth slowed in the April to June period. The world's second biggest economy grew by 7.5% compared to the previous year, down from 7.7% in the January to March period. Its growth has been hurt by slowing demand for Chinese exports from key markets such as the US and Europe. On Wednesday, an initial survey carried out by HSBC indicated that factory activity in China has continued to contract, falling to an 11-month low in July. At the same time, policymakers have found it tough to boost domestic consumption enough to offset the decline in foreign sales - triggering fears of a further slowdown in China's economy. Prompted by the slowdown, China's policymakers have announced fresh moves to boost growth. Beijing said it would suspend value-added tax (VAT) and turnover tax for small businesses with monthly sales of less than 20,000 yuan ($3,257; £2,125), starting from 1 August. The cabinet said the move would benefit more than six million small companies and boost the employment and income for millions of people. Policymakers said they would also implement measures to simplify customs clearance procedures, cut operational fees and facilitate the exports of small and medium-sized private enterprises. Analysts said that the moves were aimed at cushioning the impact of slowing growth on small businesses. "It does look like an olive branch that the government has extended to smaller businesses amid the recent slowdown in growth," Vishnu Varathan, an economist with Mizuho Bank told the BBC. "While they have not announced a massive stimulus boost or gone on a credit binge as in the past - they are keeping a look-out for those that may be affected the most by slowing economic growth." The cabinet added that it would also completely open China's railway construction market to ensure that the country can develop the sector further. It said it would set up a railway development fund, with the initial money coming from the government. However, it will encourage private players to invest in the sector. The state-owned Xinhua news agency reported that private players "will have ownership and management rights for inter-city railway links and municipal rail links". The government said it would also issue new bonds to help fund railway construction. "We must speed up preparation work to ensure a timely start to key projects in the 12th five-year plan, and push them ahead at a reasonable pace, while ensuring quality," the cabinet said.